It began a century ago with the onset of the Progressive movement and the reforms that rested control of the electoral process from political parties and reached its nader with the death of the party machines in the 1970’s and 1980’s…but have we entered a new ear of party decline? The decay of American political parties continues as the real money and power in politics shifts inexorably away from party organizations to informal and ad hoc groups. The combination of citizen grassroots movements, decentralized party structures and the vast sums of money short-circuiting the official party structures is changing the way politics works. As this story in the New York Times details, the real conversation among Republican-affiliated power brokers now takes place outside party structures. American political parties are increasingly being reduced to flags of convenience; party organizations and party institutions have little influence over events. That didn’t use to be true. Party leaders and officials once exercised significant power over the choice of nominees, over the careers of aspiring pols, and over patronage. These days, outside Chicago and a handful of other places, we no longer think of party “bosses”. Meade’s argument is well-taken as far as party organizations go, but he misses the increasing discipline of parties in the legisluature…and those “flags of convenience” can become particularly inconvenient election after election…yet party switching is extremely rare. Why is that? Clearly party commitment still matters…if party organization increasingly does not. Plutocracy and populism are often thought to be polar opposites. In American politics today they are two sides of the same coin. The same forces that allow insurgent candidates and movements to rise up in our politics also create the conditions that allow donors outsized influence. With a few exceptions, voters today are no longer content to think and vote in blocs; they are less likely to belong to one of the two major parties, are more likely to split their ballots, and they are not easily swayed by endorsements from powerful political figures. That works for two kinds of candidates: insurgency candidates with strong and committed grass roots support, and candidates who can buy the advertising time to make an impression on the voters. Fair enough. But those candidates still, for the most part, operate within the party structure. As we have seen with the Tea Party movement, which made a conscious choice to pursue political change from within the Republican Party rather than from without. American politics today occupies a space that is institutionally weak. A candidate with a lot of money (his own or raised from donors) can make an instant name and reputation; a movement that energizes the public can push aside established party figures to anoint its own candidates for public office. President Obama’s victory in the 2008 campaign for the Democratic nomination was a triumph over the pro-Clinton party establishment as surely as the surprising Tea Party victories in GOP senatorial primaries showed the weakness of the Republican establishment. But is that a bad thing? Even if money increasingly dominates in political choices (and I’m not convinced that isn’t more about the technological revolution rather than a political one), was it any better when old men in smoke-filled backrooms chose who the people could choose from? The appearance of unconventional figures in politics is one reflection of this trend. Strong party machines tend to produce dull and forgettable candidates. A candidate selected by a party machine might have to tell voters that “I am not a crook;” such a candidate would probably not need to make a television commercial to explain to voters that “I am not a witch.” Populist politicians tend to be more flamboyant; they have to be able to mobilize their followers. From Jesse Ventura to Al Franken and Sarah Palin, we are seeing more politicians whose ability to command attention and mobilize the base counts for more than their ability to rise patiently through the ranks of a party machine. Yes we have seen some unconventional political figures in the past few decades. But there were quite a few prior to that as well. And the above examples don’t provide strong evidence that a weakened party system produces unconventional politicians. Of the above, Ventura won a 3-way race in Minnseota and only served one term. Al Franken, again Minnesota (what’s with Minnesota? ), won a 3-way race and is in his first term. Sarah Palin was a one-term governor and was *selected* by McCain to be the VP nominee. She hasn’t run for anything since. The candidate who had to say she isn’t a witch, lost. So it isn’t at all clear from these examples that the system is producing unconventional politicans…it might be more correct to say it has done a good job of punishing them for their unconventiality. Anyway, it’s an interesting essay. Read the whole thing. H/T Instapundit. 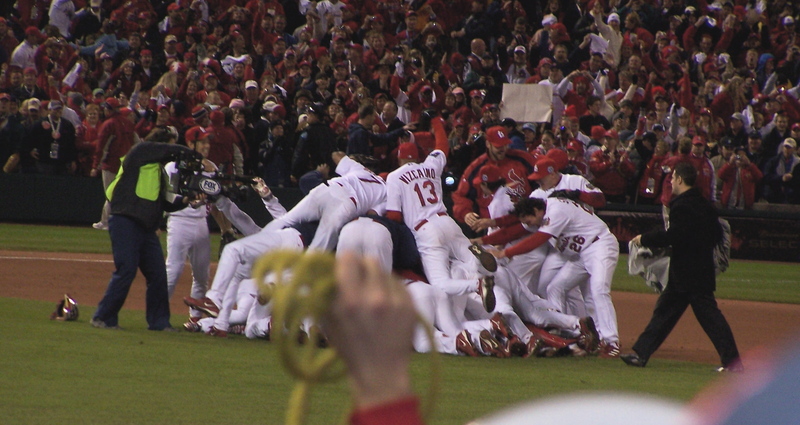 Cardinals Win Unbelievable Game Six! Wow. Just Wow. Below, the win probability chart…that is the chart that indicates the probability of winning given the game situation (score, men on, outs, inning, etc.). Wow. Something very important happened in the Senate on Thursday, or at least it is possible that something very important happened…depending on whether what happened stands the test of time. The key institutional difference between the Senate and the House is the role of the minority in the legislative process. In the House of Representatives, the institution is very much top-down and hierarchical (partly b/c of necessity — size makes floor time a scarce commodity). However, in the Senate every senator is an “island of power.” The minority has a number of powers that make the Senate a supermajoritarian institution. The most significant of these is the filibuster. However, less well known and relevant to what happened on Thursday is the right of the minority to offer any amendment (no germaneness rule) to a bill proposed by a majority. The absence of a germaneness rule (in the House, all amendments must be “germane” to the bill they are amending…for example an amendment to an agricultural appropriations that contains a subsidy for cotton farmers would be germane while an amendment to prohibit partial-birth abortions would not) in the Senate is one of the reasons individual senators and the minority are so powerful. There is no way to prevent Senators from getting their preferred legislation considered on the floor. This is also why committees aren’t as important in the Senate — in the House committees are much more effective gatekeepers as the bills they report to the floor cannot become the vehicle for any and every interest a member of the House might have. This brings us to what happened on Thursday. First, let me set the stage politically. President Obama, starting with a joint-session of Congress, has been pushing his jobs bill, the American Jobs Act. Obama has clearly been using it as a bludgeon with which to hit the Republicans in Congress over their collective heads on the campaign trail. Obama’s campaign reelection team has clearly determined that following the Harry Truman historical lesson (run against a “Do Nothing” Republican Congress) is the best path to victory for Obama, given the sagging economy. Part of that has been a rhetorical attack on the Republicans, taking them to task for blocking a full vote on his American Jobs Act in its entirety. While the Republicans would clearly like to break up the bill and only pass the parts that they like (there are a number of ‘poison pills’ in the AJA for Republicans, including tax increases on high income earners), Obama has called on Congress to “pass the bill” now and in full. There’s a significant problem with this line of attack for President Obama, however. Namely, a number of members of Congress from his own party have expressed skepticism and concern over the AJA…particularly the fact it raises taxes on the cusp of a possible double-dip recession. It’s entirely possible that the AJA, if put up for a vote in the Senate, would be rejected by a bipartisan cross-section of the Senate. That would be a triple blow — refuting the rhetorical argument Obama has been stumping with, dealing Obama a bipartisan defeat of his jobs bill, and eliminating any argument Obama might offer that would place blame for the economy at the foot of a do-nothing Congress. Reid’s move strips the minority of the power to force politically-charged procedural votes after the Senate has voted to cut off a potential filibuster and move to a final vote, which the Senate did on the China measure Tuesday morning, 62-38. We’ve had alot of movement on the Republican side of things for the 2012 presidential race. Mike Huckabee is still out. Chris Christe is still and now seems to be definately out. And Palin has declared herself out for the 2012 race. Perrry has slumped after some poor debate performances and his opponents have successfully undercut his support by painting him as soft on illegal immigration. Herman Cain, the former CEO of Godfather’s Pizza, has surged in support, winning the straw poll in Florida. Mitt Romney has been the big winner in all of this. I thought there was a fairly strong possibility that Perry would run away with the nomination (given Romney’s weaknesses with the base and the appeal of a Southern governor with a strong jobs record), but that has not happened. Perry could still win the nomination, but his road is going to be a tough one. There has always been a tendency in the Republican party to nominate the presidential candidate whose “turn” it was (see Dole, Bob 1996; McCain, John 2008), and Romney may be benefiting from that. I also think I may have underestimated how much Romney has improved as a candidate in the three years since his unsuccessful bid for the nomination in 2008. Romney has tightened his message, done his best to armour his Achilles Heel (Romney Care), and handled his critics’ attacks with much greater aplomb in this election season. Via Megan McCardle. H/T Instapundit.